Yes, U.S. student loans amount to some $1.2 trillion. Yet the new on-campus trend is luxury student housing. A few weeks ago, a friend showed me around the campus of a private university and I saw the upscale student apartments. Next to the apartments was even a bigger-than-usual Starbucks. I thought the luxury student housing at this university might be unique. Landmark [Properties], like other student housing developers, is profiting from ever-growing demand ... . Landmark grew 40 percent even during the recession and is plowing ahead with several new projects. The Standard, a high-security building [at the University of Georgia], offers students luxury apartments with granite countertops in the kitchen and en suite bathrooms for each bedroom. ... What really draws attention, though, are the added amenities. The pool, fitness center, saunas, game room with large-screen televisions and even a golf simulator. Here you have evidence of a bubble in both housing and education. Specifically, institutional investors are buying properties for real estate investment trusts. New home sales generally fall in bear markets. With the added impetus of a brief deflation, home sales plunged dramatically in 2008/2009. 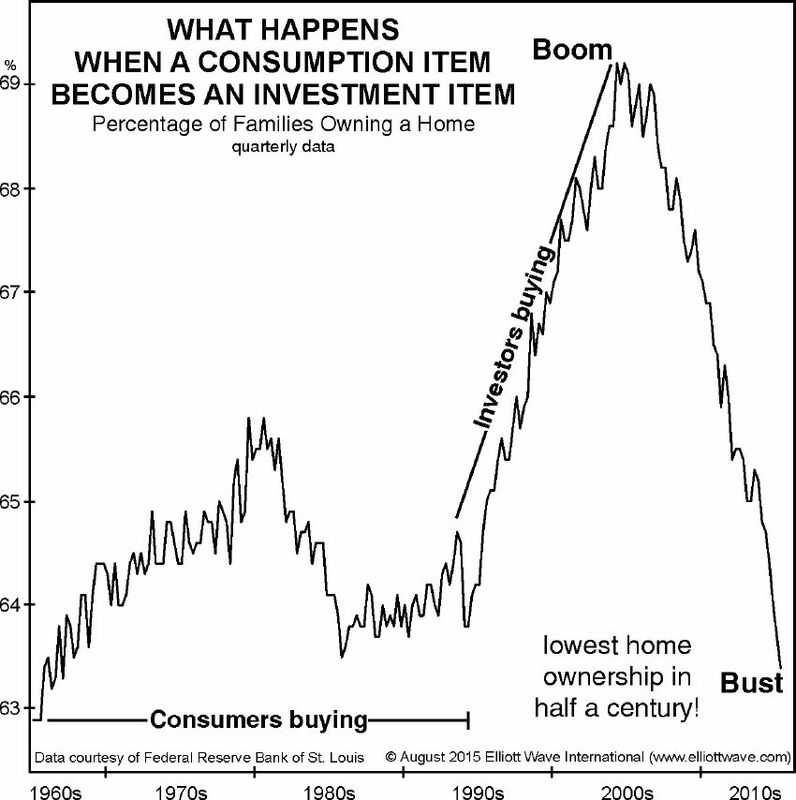 The current recovery has barely managed to return sales to prior lows. After the major stock averages reverse and an even more aggressive bout of deflation takes hold, U.S. real estate will join a global decline that will be even more severe than the last one. This article was syndicated by Elliott Wave International and was originally published under the headline (Video, 3:41 min.) Investors Bet on Housing Again (Just in Time for Another Implosion?). EWI is the world's largest market forecasting firm. Its staff of full-time analysts led by Chartered Market Technician Robert Prechter provides 24-hour-a-day market analysis to institutional and private investors around the world.